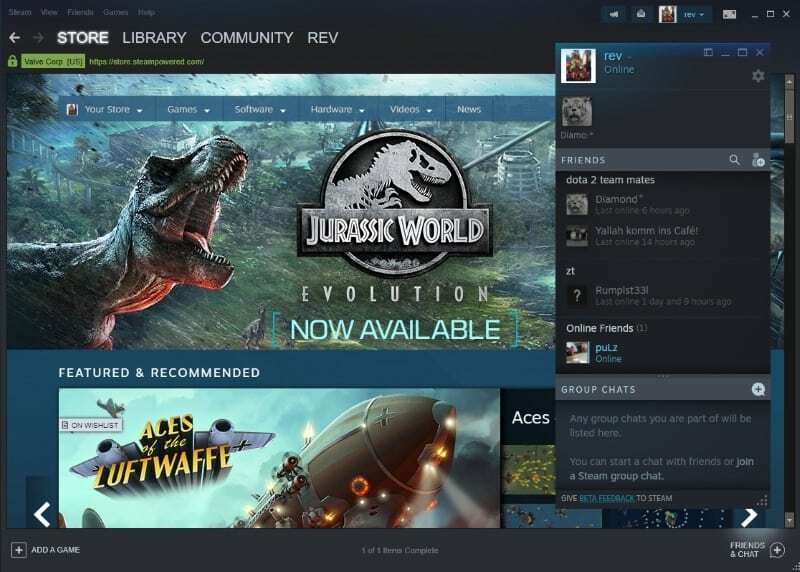 The most recent beta version of the Steam gaming platform client for desktop systems comes with a new chat system that modernizes Steam's somewhat dated chat experience. The new functionality is in beta at the time of writing. You can join and leave the beta channel at any time by selecting Steam > Settings > Account. The very first thing that you may notice is that the chat interface is now detached from the main interface. It features a number of improvements including options to pin friends or group chats to the top for fast access and a group chats interface that lists chats right then and there. You can start group chats with a click on the plus icon; any chat that you create this way is listed immediately under group chats in the interface. Once your friends start playing games you will see their status and if they are in a party with other friends. Not all games show what Valve calls rich presence but many popular ones do already. Another new feature is that friends are grouped by game now when they play games and that they may also be grouped by party. 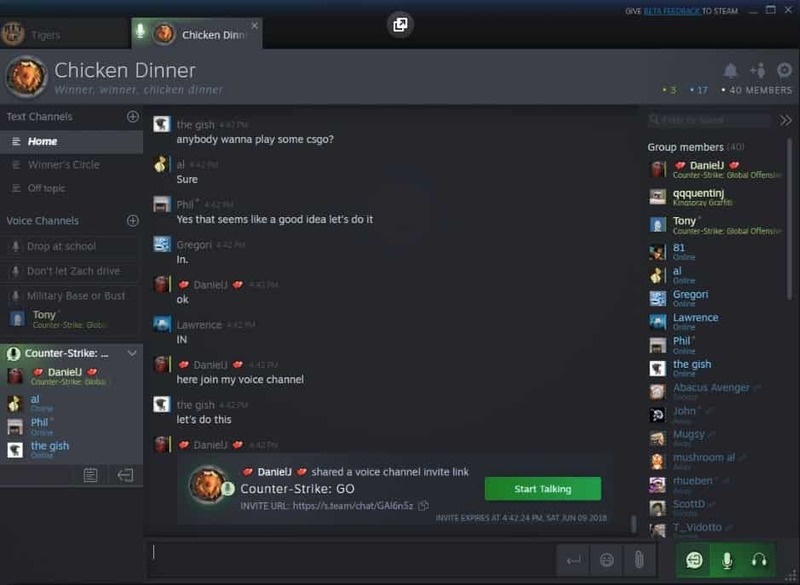 Valve modernized the chat interface and its capabilities as well. Steam chat supports video embeds, e.g. from YouTube, pictures, tweets, and other media content inline now.You can paste images into the chat simply by copying them to the Clipboard and pasting them. Other media content is recognized automatically, e.g. videos on YouTube, and embedded so that the content can be viewed directly in the chat window and not by clicking on the link to load an external resource in a web browser. Chat makes it easy now to add friends to group chats and these chats even persist across Steam sessions so that they become available whenever you sign in to Steam on supported devices. It is easier to start a voice chat now to get everyone join the same channel within seconds of posting the voice chat link in group chat. You can post invites to group chat to individual friends but also in group chats or by using text links and sending them using email or other means of communication outside of the Steam client. Valve revealed that it invested heavily in making voice chat better resulting in clearer, crisper voice quality. Voice chat was rewritten using WebRTC which means that voice chat is encrypted now, that traffic is sent through Steam servers, and that it uses Opus encoding now. Your IP address is private in the new system to prevent attacks and privacy issues. All chat features are also available on the Web. Point your favorite browser to https://steamcommunity.com/chat and sign in to your account to use the new functionality. Valve's feeling the pressure from Discord (and other chat services) and an overhaul of the chat interface and functionality was long overdue. Whether that is enough to convince users to skip third-party chat clients to go back to Steam remains to be seen. Chat logging would be a great update too.